All three of these examples are things that Google Keep can remind you to do. The last one, about checking the Verizon signal is something I used yesterday. I knew I would forget to do it unless I could get a reminder, but any normal reminder system would just beep me at a certain time. I didn’t know what time we would be driving thru the town, I wanted a reminder when we were at that location. 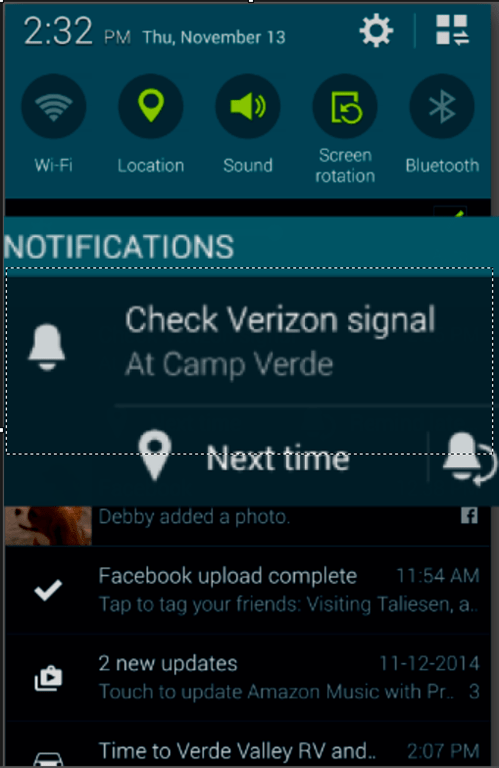 Google Keep, on my Android phone, knew when we hit the limits of Camp Verde and popped up a notification reminding me to check the Verizon signal. Available for Android or on the web and chrome store. Published by MrsGeek, in Blog. Tagged with Apps for Travelers. Thanks, I will add Google Keep. Right now I just use the simple Color Note app with plenty of remunderstanding of little stuff. For example, the ink jet cartridge #s for our various printers, battery sizes fie hearing aides, cameras, and other electronics, etc. I also keep a link of my file in my DropBox.